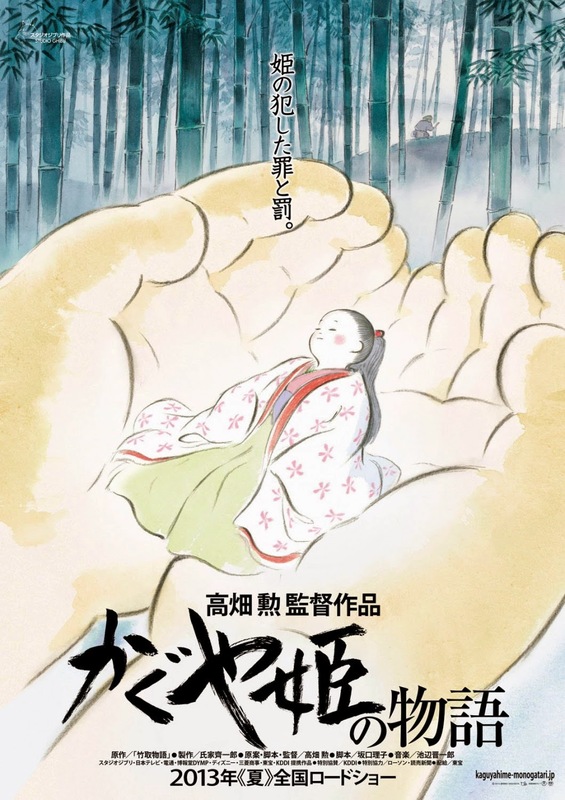 Movie: "The Tale of Princess Kaguya"/"Kaguyahime no monogatari"
A bamboo cutter is working in the fields one day when he cuts open a bamboo shoot to find a tiny girl inside dressed as a princess. He brings the tiny princess home to show his wife, upon which the tiny girl turns into a regular sized baby. The couple raise this baby as their daughter, but she isn't like other children as she seems to grow at a much faster rate. As time passes, the bamboo fields offer more things for the princess in the way of gold and fine clothing. The bamboo cutter eventually decides to move his princess to the capital and turn her into authentic princess. She is trained by a tutor to act as a princess would act and is given the name Princess Kaguya. The longer Kaguya lives as a princess, the less happy she becomes. The mystery of where she came, from once revealed, can change all of their lives forever. The second in a pair of films that got nominated over "The Lego Movie" at the 2015 Oscars this past February, "The Tale of Princess Kaguya" was a movie a relatively small amount of people had heard of until the day the nominations were announced, but boy, are we glad we watched this movie! This film is done in a classical animation style that is reminiscent of old Japanese art work and storybooks. It is a very beautiful film visually. By bringing this classic folktale to life, it gives viewers a fantastic look into Japanese culture. The story walks a fine line that balances between tragic and uplifting, as most modern cartoons from the likes of Pixar and DreamWorks do, but here, it seems so much more mature and even-handed. A childless couple finds a princess and raise her as their own, but they get so caught up in what they think she is destined to be that they never really pay attention to what she wanted to be. The life she leads, or in Princess Kaguya's case, the shell of a life she leads, is one that has every road paved perfectly for her with no spontaneity and no excitement. This leads to a lot of melancholy scenes and moments of woe. It is a very emotionally moving story, a fine dance between heartbreaking and happy all at the same time that is well developed and well told, too. It is fantastical and frank, elegant and poignant. We watched this movie un-dubbed and in its original language, which we think is the best way to watch movies like this, the way they were intended. The creative bar has been raised for Studio Ghibli with this brilliant piece of cinema. Though this is an animated film, it is not necessarily a movie for little kids. BigJ and I are huge proponents of animated films which are either completely or not wholly intended for children. "The Tale of Princess Kaguya" is absolutely deserving of all its praise, and though "The Lego Movie" was excellent, this film definitely deserved to be at the top of the list where 2014's animated features are concerned. Simply delightful, and yet so tragic at the same time.